The oddly shaped Caprivi Strip, previously known as Itenge, was so named after German Chancellor Leo von Caprivi who negotiated the acquisition of the land from the United Kingdom in 1890. The purpose was to gain access to the inner parts of Africa as well as the Indian Ocean. This proved impossible to navigate when it was discovered that the roaring Victoria Falls was blocking passage. 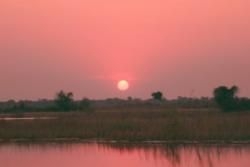 Stretching roughly 450km to the east and bordered by 4 perennial rivers namely the Okavango, Chobe, Kwando and the mighty Zambezi, the area is home to an incredibly rich assortment of wildlife, birds and greenery. The rivers define Namibia’s borders to Botswana, Zambia, Zimbabwe and Angola of which all four countries can be accessed. With its impressive collection of wildlife, save the rhino, the area is a web of rivers, wetlands, islands and breathtaking scenery, quite the opposite from the rest of the country with its desert character. As a gateway to the world famous Okavango Delta and national parks such as Chobe and Moremi, the Caprivi Strip can be a traveler’s paradise. Boasting nearly 200 flora species and over 600 bird species just adds to its magic.